Please join myself and a panel of experts who will present an overview on Impact Fees, their purpose and how Winnipeg’s new impact fees will affect the communities of Waverley West. On October 26, 2016, under the leadership of Mayor Bowman, City Council voted 10 to 6 to support the implementation of an ‘Impact Fee’ on all new homes being built in Waverley West (and other suburban communities throughout Winnipeg – SEE MAP). Effective May 1, 2017, a fee of $54.73 per sq. metre ($5,084.42 per 1,000 sq. feet) will be charged on new homes. I did not support implementation of the impact fee because the ‘process’ used to develop the by-law did not adhere to best practices; the process was not open, transparent and collaborative with all stakeholders. Regardless, 10 members of Council did support implementation of the Impact Fee. See my City Council speech on October 26 regarding impact fees. Why do we need an impact fee? How was the exact value of the impact fee determined? How will this fee impact commercial activity in the community ? How will this fee impact growth in Waverley West communities? Where does this fee go? What growth related activities will it be supporting ? Regrettably, during the process of developing the fee, Mayor Bowman and Councillor Orlikow (lead elected officials on the initiative) did not hold any public consultations to help residents understand the how’s and why’s of an impact fee. The City of Calgary recently implemented a similar fee (called a levy) and held three public sessions – Calgary followed best practices and the process took just over a year. In Winnipeg, the process used to determine a fee took less than 2 months. My thanks to the Winnipeg Free Press and CBC for reporting on this event. Janice Lukes voted last week against the controversial impact fee proposal and she believes someone at city hall should let the public know how it’s going to be implemented. Lukes (South Winnipeg-St. Norbert) said she’ll be holding a public forum in February to show potential home buyers in her ward how they’ll be affected when the new fees takes effect May 1. Lukes’ opposition to the impact fees plan was seen as a major factor in Mayor Brian Bowman’s decision after the vote to remove her from both his executive policy committee and her position as chairwoman of council’s public works committee. Lukes had been vocal in her opposition to the manner in which Bowman pushed the proposal through council, and she continues her criticism in a post on her personal website, where she is promoting the Feb. 8 event at the Waverley Heights Community Centre. “I did not support implementation of the impact fee because the ‘process’ used to develop the bylaw did not adhere to best practices; the process was not open, transparent and collaborative with all stakeholders,” Lukes said in a blog posting. Lukes said Waverley West is one of the areas in the city where the fees will apply to newly constructed homes and it’s important the public understands how it’s going to work. She said she won’t use the forum to continue her criticism of Bowman, adding the event will provide answers to the questions members of the public have been asking. Lukes said the forum will explain why there’s a need for an impact fee, how the exact value of the impact fee was determined, how the fee will impact commercial activity in the community, how the fee will impact growth in Waverley West, how the fee revenue will be spent and what growth-related activities will it support? aldo.santin@freepress.mb.ca Read more by Aldo Santin. Confusion over Winnipeg’s growth-fee plan has left some homebuyers guessing whether they’ll get dinged by the new charge next year. City council voted 10-6 last week to approve new charges of roughly $500 for every 100 square feet of new residential space. The fees are supposed to kick in on May 1 in selected areas at the fringes of the city. Winnipegger Darcy Hiebert, who’s placed a down payment on a 1,200-square-foot home slated to rise in the new Transcona neighbourhood of Crocus Meadows, said he had difficulty determining whether he’ll be charged the $6,000 fee on top of the $340,000 purchase price. For starters, the City of Winnipeg has yet to publish a clear map of the areas that will be affected by the fees. 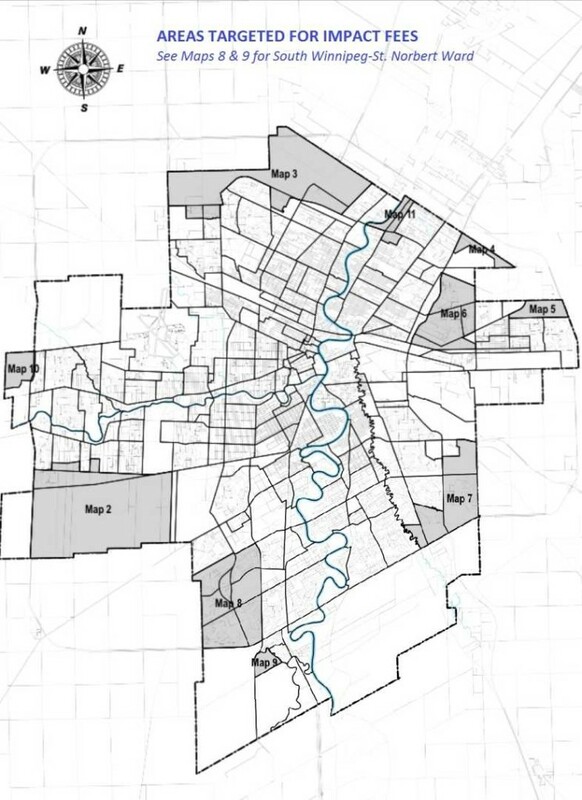 The only map online right now is an annotated black-and-white document embedded in the minutes of the Oct. 26 council meeting. Hiebert also said if his new home does wind up within the area, he was also unclear whether the charge applies to the project. Construction on his home begins this December but won’t be finished until after the fees are supposed to kick in on May 1. Hiebert said his real estate agent assured him the fee would not apply after he failed to obtain a definitive answer from the city. He said the city has done a poor job of communicating its plans. South Winnipeg-St. Norbert Coun. Janice Lukes, who was kicked off council’s executive policy committee one day after she voted against growth fees, said she has been inundated with similar questions from prospective homebuyers in her ward. She’s organized a February public meeting to help answer questions from residents. She said she’s waiting until after the holiday season in order to allow more people can attend what she calls an “impact fees 101” session. “From the calls I’ve been getting from my constituents, I don’t think the city has been doing a very good job at all.… It’s a very complicated, complex matter,” she said. Lukes said Calgary, which spent three years developing growth fees, has a website that allows residents to enter information about a new project and find out immediately what the fee will be. Mayor Brian Bowman announced his intention to bring in growth fees in February. The city unveiled its growth-fee plan in September and council approved it in October. Bowman said it was crucial for council to approve fees in a timely manner in order to provide certainty for the construction and home-building industry. He also dismissed assertions from developers who claimed the city wanted to ensure the fees were in place in time to factor them into the 2017 budget. The city’s spending plan for next year will be unveiled on Nov. 22.